Punting along the River Cam in Cambridge is one of the most relaxing and quintessentially ‘Cambridge’ things to do on your trip to the city and it would therefore be upsetting if anything were to happen. Sadly, there are a number of groups who are un-licenced, and as such are illegally selling tickets in the centre of Cambridge and along the main tourist areas such as King's Parade and the Market Square. 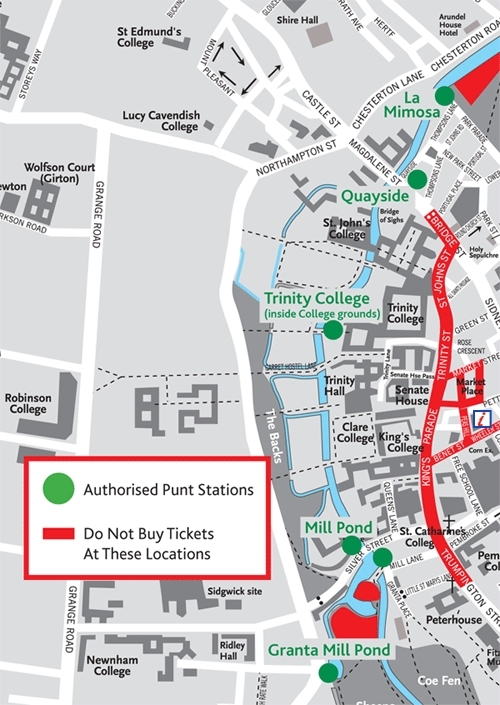 The tourist information centre, Visit Cambridge, have teamed up with Cambridge City Council to provide a map showing the locations of the fully licenced companies and areas of the city in which to avoid buying tickets (please see below). As the oldest company, Scudamore’s is very well known in Cambridge and we aim to provide each and every customer with a tailored service, be this if they have already bought their ticket from one of our agreed third party sellers or are approached by one of our River Tour Guides on the day. We operate at two locations in Cambridge; Mill Pond (Silver Street) and Quayside (Magdalene Bridge) and our trained River Tour Guides can be found here to answer your questions and to help you have a wonderful tour. We are not allowed to operate at any other locations. Our staff are characterised by their smart white shirts and navy Scudamore’s branded waistcoats in the summer and a navy coat or jumper during the Winter, again which will be branded with our Logo. Look out for us when you’re next in Cambridge and remember, to avoid disappointment, please only buy tickets from the licenced operators!